I have to admit, I’ve always been a picky pattern person. I don’t do a ton of florals, I tend to stick to my stripes, polka dots and plaids – and love to mix them up (more about that in another post!) I owned my stack of graphic tees when they were the thing to own but I haven’t gotten much in to the “critter” sweaters or any other “cutesy” prints. 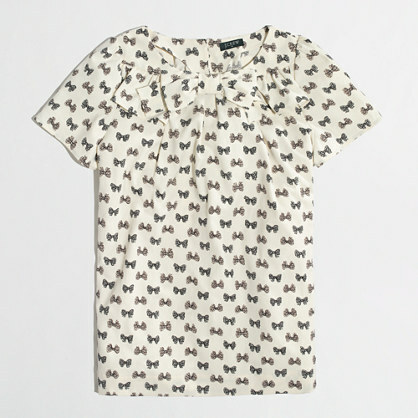 So when I took a chance and ordered the J.Crew Factory bow blouse last month – this was a leap for me. I saw a lot of people raving online about the bows and while I have my share of bow shoes…I wasn’t sure how I was going to do with a bow print. Sure, I love how it looks on everyone else, but me…not so sure. And it had a big bow at the neck? Wow, talk about a case of peer pressure to order this blouse, because I still hit the ‘place order’ button even though I wasn’t totally sold. I pulled it out a few times and was a little stumped on styling until on a Sunday evening session of choosing my outfits for the week, I decided to try this with the Maple Tweed skirt. And…well, here’s the result. I have to say, I was pretty pleased. I did cover the neckline bow with a necklace…and I haven’t worn the blouse since this outfit so I think I need the challenge of a second outfit. The outfit is all J.Crew….mostly from this past year except the cardigan is the J.Crew cashmere boyfriend sweater from a few years ago and the necklace I found via Groopdealz however it is a J.Crew “inspired” piece. 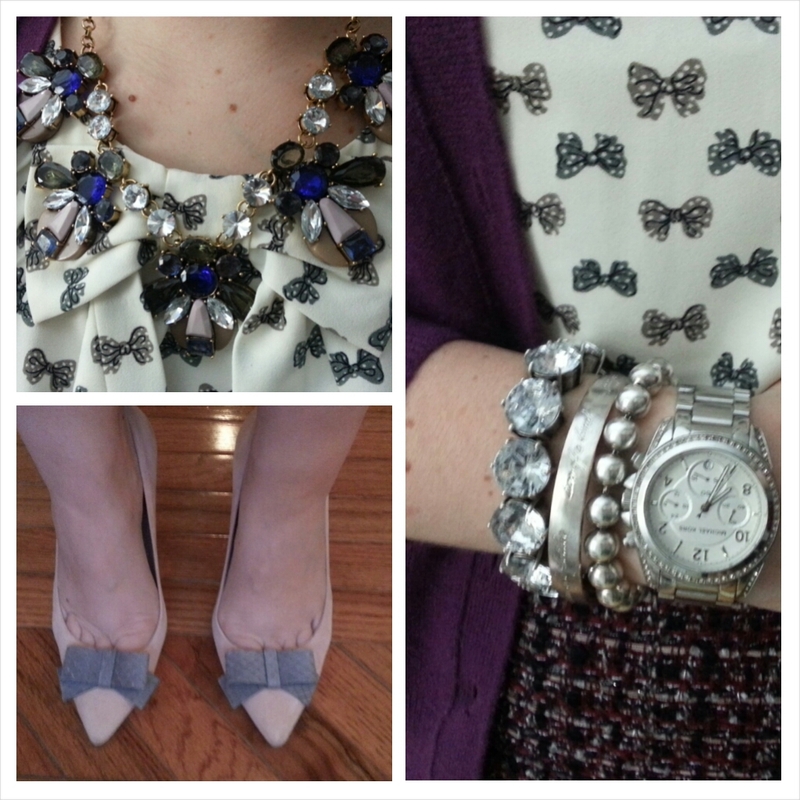 And finally, here’ s another outfit where I “put a bow on it” in the way of a Target glitter bow belt and Groopdealz Kate Spade inspired bow bracelet. So, any outfit faves? 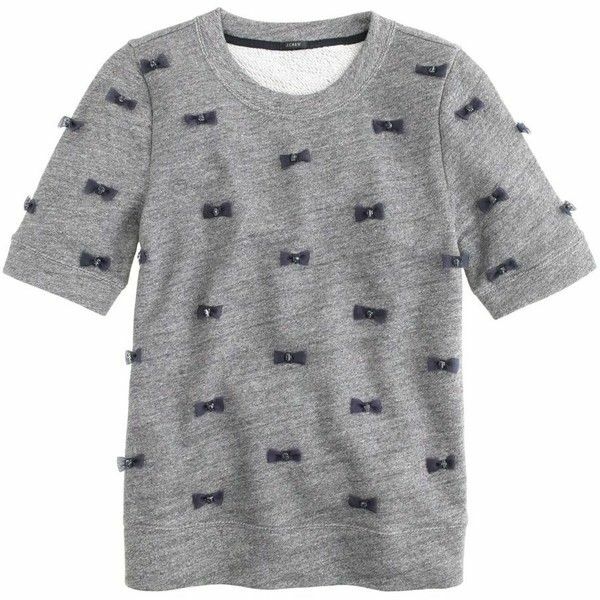 Do you love bows or are they too girly and cute for you? Would love to hear what you think and thanks for visiting! Hey! I wanted to know where your polka dot top was from!? Thanks! Hi! 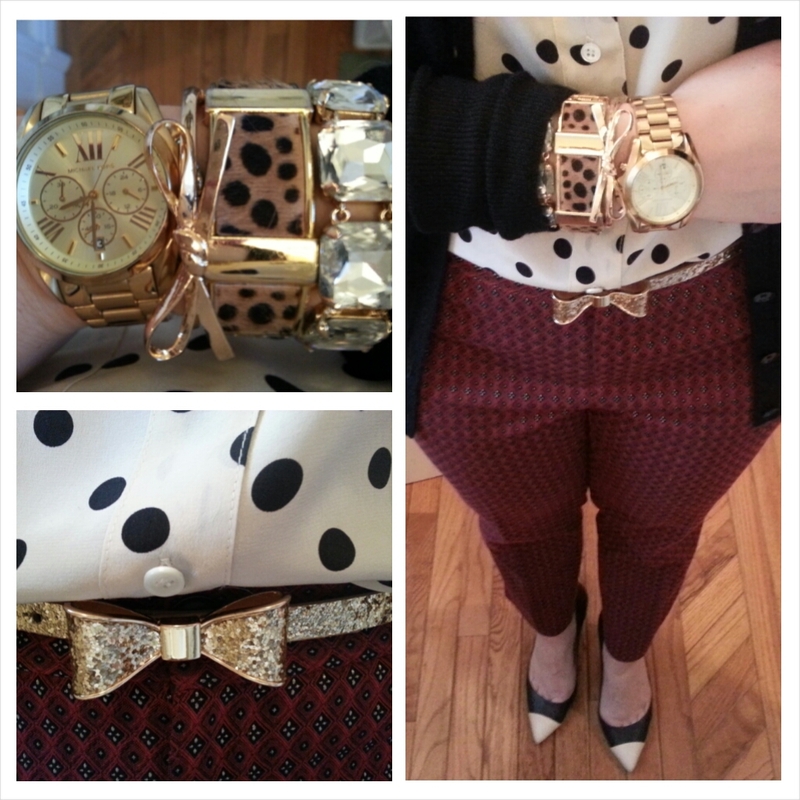 The polka dot blouse is the polka dot Blythe blouse from J.Crew – came out in Holiday 2012. I still see them floating around on eBay now and then…hope that helps! thanks for reading! 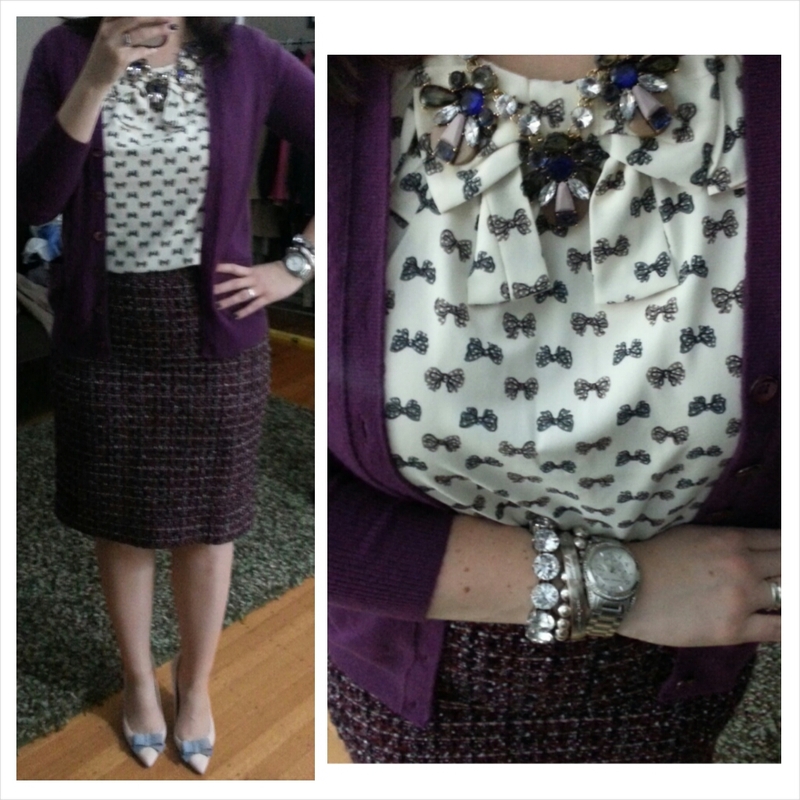 the tweed + purple + factory bow blouse outfit is nice, and harks back to 50’s style imo. i think adding the necklace helped with the questionable neckline bow; makes me wonder if there’s a way to remove the bow without destroying the neck. anyway here’s a challenge: incorporate the bow blouse into a outfit based around yellow or orange.